I just got an e-mail that my football tickets have shipped for the forthcoming college football season. I can hardly believe it. 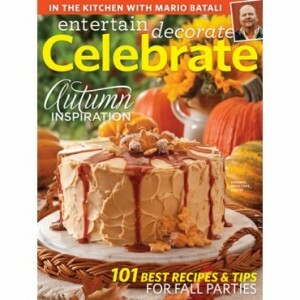 It is time to pull out the old tailgating recipes and start planning. I look forward to this time of year with great anticipation, but football season is also a time of reflection on special times in the past. My boys were in high school and homecoming time rolled around. I, of course, reflected on the good old days when I was in high school and asked where we needed to order the corsages for dates. Much to my amazement, corsages today are everything from roses to orchids to carnations. So I must ask the obvious question: whatever happened to the football mum? Yes, the mum. The one with your school letters made of pipe cleaners and inserted into the center of the mum. I remember the first time I saw one of those beauties was on my mom. Dad had taken us to homecoming in Tuscaloosa, (yes, University of Alabama OK, it’s out) and she had a cream mum with crimson and white ribbon streamers, and it was carefully pinned on her glorious tailored suit. The whole look was stunning. When I got to high school and homecoming was fast approaching, I was secretly hoping for one of the mums from my date. At that time, the competition was to see who could sport the longest ribbons hanging from the corsage. Mine was a medium length and was very respectable. Plus there was a tiny brown football hanging right below the mum. A couple of years later, my sister Janice made the cheerleading squad, (that’s a separate post altogether) and for homecoming that year she didn’t have a date as she was concentrating on the cheerleading events surrounding the whole weekend. My brother Keith and I were determined she was going to have the traditional mum and ordered one for her with the requisite pipe-cleaner lettering plus we ordered 36-inch long ribbon streamers that were sure to hang to the hem of the cheerleading uniform. Done. That particular evening, when the cheerleaders came out, there she was with the longest streamers. Mission accomplished. Those are the dream nights that live forever. What ever happened to the football mum? I wish today girls would sport those large softball sized mums with all the trappings. It just occurred to me that I could wear one to a game and see if I get any attention. I wonder if there is a florist that even understands the concept. I know you have football memories. Will you share them with us? I’m looking into the history of homecoming game corsages. Seems they were very big in Texas, but I’m wondering if they were also important in Louisiana and whether this was a high school or a college item? 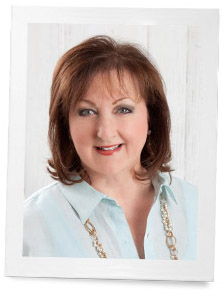 I love your Celebrate Magazine and look forward to your “Ribbon in My Journal” posts! I have so many memories that mirror yours, including your football mum memories. As a small child, I remember those amazing football mum corsages that my mother wore to the Kansas State University football games each week. My sisters and I thought they were the coolest! Last year for the KSU Homecoming game, my sisters and our daughters all decided we wanted to bring back the tradition. I am the owner of a wedding consulting business and went to one of my floral suppliers to try to obtain large mums. I pre-ordered them and was a bit disappointed to see the smaller size when they arrived. I made all of the corsages anyway and we sported them the entire Game Day. We received endless compliments, at our tailgate party and the game, and had such fun with them! I’m glad to hear this tradition still reigns in some parts of the country. I think I’ve always had a little “southern” in me! 🙂 We will try again this year to promote this sweet tradition. Wishing you a great football season! Go Cats! These are all such wonderful stories. I loved reading each of them. I grew up in Texas, Hookem’ Horns, where football reigns supreme. At any age and any level. My husband of 36 years was my high school sweetheart. The only thing is we didn’t go to the same high school, we went to rival schools. So I actually got to go to two homecomings each year and my sweet husband bought a different mum for each school. Luckily by the time college came around we were on the same page. Saved him a few dollars. I love looking back at all of the old pictures of us. Me at 5’1” and 100 pounds soaking wet those mums were almost as big as I was. Oh yes, I do remember those huge mums with what seemed like hundreds of streamers! They seem to still be popular here in Texas. It is not unusual to see a newspaper picture of the reining Homecoming Queen wearing one on each shoulder. Quite a sight to behold! When I was a girl the mums were real and the streamers were about waist long. Now the mums are artificial with everything that the craft store sells, mascot heads, letters with team name, boys name, girls name, bells etc. The cost in my time might be $15 but now it is not unusual for the cost to be $50. Last year, the girl asked my grandson to the homecoming game (7th grade and they only met at the game). He was expected to provide the mum. Times have changed many times over since the ‘6os!!! Born and raised a war eagle! I sold the beautiful flowers in high school for the college games . I remember dreaming of the day I would be in college and someone would buy one for me. That day did come and one I will always remember. We also dressed to the nines hat gloves etc. but I don’t remember it being so hot back then. Thanks for the memories . Oh my yes—-we dressed up to go to a game. I remember wearing suit, hose and heels to AL-TN game and it was was 99 degrees, but we looked fabulous. Times have really changed! It is wonderful reading everyone’s memories of football, it really is a Southern culture and social event not shared in all parts of the country. Living in Colorado I miss my Saturday football. The South and college football are like no other place. When my Hogs play in Fayetteville on beautiful fall days it’s heaven. Go Hogs! Yep, football is big here in Texas. Last year, they even started broadcasting the high school games from smaller towns, on local tv. Only the cheerleaders, Homecoming Queen and Princesses, got to wear a mum to games, back in my day. I was in the band and our band director didn’t want even jewelry when we were in uniform. A few girls with very special boyfriends got a mum to wear on football day. We couldn’t even wear jeans to school! When we wee seniors, we rebelled. We all wore overalls to school one football Friday. And several of the football players got Mohawks. They got kicked off the team and we were sent home to change. After that, they did let us wear jeans to school on football Fridays. But those boys couldn’t play until their hair grew out and they had a decent haircut! During my yeas of teaching, though, the corsages grew more and more elaborate until it looked like the little girl with the corsage was going to tip over! Each person had to outdo the others. Same became true of balloons on Valentine’s Day! So often, though, it no longer came from a date or boyfriend, it was from parents who wanted their child to outshine the others. I remember n high school, having to make hamburger steaks I homemaking class to feed the football boys before games. And, during Homecoming, watching the ladies all dressed up in their suits and hats, heels, coats with those foxes on them, and jewelry, coming back to homecoming. There were Teas in the Homecoming room, where we, as students, were ushered off to class. There were luncheons, a dance after the game, and get togethers for the men, who dressed in suits. The homecoming queen was the oldest woman present! I hoped that someday I would be coming back, looking so well dressed, and with a good looking, successful husband-someday. No more. Our little town has dwindled down to a 6-man team. Our Reunions are held every 4 years, in a different town. Only a few couples are left who care able to dance. People just come to eat, visit a little while, and leave. I did go to some larger high school football games when my grandson was a student trainer. Those wee so different, but there were a lot of empty seats, even at Homecoming. I know, there are fans who will be there with their team, no matter what. My sister is totally opposite from me. She lives and breathes sports. She was a coach and PE teacher, ran marathons, got into tennis. Until she had to have 4 back surgeries! She still stays active and loves her sports. Dressing up and going dancing was my favorite sport! 🙂 Well, at one time, between teaching jobs, I got a part time job at a newspaper,. Started writing lunch menus and obits, some editing. Later moved on up and the editor made me the Soc Editor! And then I did some features, courthouse records, trials, etc. But, then came the funny part. He made me the Sports Editor! I didn’t have aclue abot sports, eespeicailly in a town that I didn’t really know! I did know the owner of the radio station, from my hometown. My boss didn’t want to pay me to go to any games. he just expected me to call and get the story from the coaches. Well, that didn’t work for me. So, sometimes, after work, I would go to a game and sit behind the radio announcer. I would hear a phrase and think, “Oh that sounds good!” and I would write it down. Back at the office, I would call the coaches for their statistics. Then I would read a city newspaper to find some more sport terms. Then I could, nervously, write my story! I nearly fell over my desk when the editor said, at a meeting, that the Soc page was looking good, and the Sports page really looked good! I was hoping he would give that job to the photographer who covered all those games! He really should have had that job. I didn’t have any idea what I was doing! Now doing features on artists, etc. was more up my alley! When the editor and reporter went on vacation at the same time, I got to be editor, reporter, and got to delegate jobs. Thank goodness, the other people who put the paper together knew what they were doing! Even the president came to Ft. Hood and I sent out or photographer to join other reporters. I wanted to go so bad!!! Took us forever to get that paper out, but the editor was pleased. Too much stress for me, so I went back to teaching! So, guess what! They had me teach Journalism because of my experience with newspapers! I had an English minor, but never had any journalism classes! Oh, well, it was an experience. Never did get that Mum, but one principal did give all the lady teachers a rose on Valentine’s Day! KAMU tv, our Aggie PBS station, does have a program called “The Aggie Band Show”, after the games, so we do get to see the band and students that way. Wish the networks would understand that there are a lot of people who don’t want to hear those boring men talking during half time. We want to see the bands! Good idea about wearing your Mum to the games. Hopefully that will start a trend. When we see the people going to the games here, it’s a stream of people in t-shirts, shorts, and tennis shoes. Except for those in uniform with the Corps, etc. But they do have lots of things in craft stores, florsts, and a lot of people just ake them for the games. That’s amazing. Thank you for sharing your memories with us. Phyllis, If I remember correctly, your mom went into labor with you on the Alabama vs Tennessee football game day. This does indicate that you have been a football fan since birth. Yes absolutely. October 17 was the Saturday of the game. When I was in high school the mums were real and sold by some school club as a fundraiser. My mom worked at the school (not always a lot of fun) and my brother and sisters and would always make sure she had a mum to wear. It doesn’t seem like much today but it meant the world to her then. You need to move to Texas. Friday night football reigns supreme. If the ads from local florist and craft stores are any indication, mums are still here. I do not have children, therefore, no grands so maybe I’m missing the latest trends. Thank you Fran I love Texas. I have spoken for many organizations in Texas. Thank Heaven For Football Season, It’s been a long dry spell! Go-o-o-o Redskins!!!!!!!!!! I almost forgot, we are a house divided when it come to college ball, My sister got her masters from UVA, My niece got her degree from UNC Chapel Hill, My nephew from Vanderbilt, and another nephew got his masters from VA Tech.! My husband and I got our degrees from schools that either had no program, (I went to an all girls school or, the program was miserable at best,I was asked not to mention it!) Go ACC with a little SEC on the side!!!!!!!!!!!! 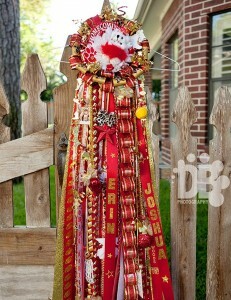 While I grew up in New Jersey, I also loved my football mums. I proudly wore a green “R” for Ramapo. Things changed when I got to college though, and the mum was gone like so many other traditions. Would love to see this tradition start again. Question: when I was in high school, we got corsages for our birthdays. There were dog biscuits for 14 (puppy love), lifesavers for 15 (be careful), sugar cubes for 16, etc. Was this just a New Jersey tradition or was this everywhere? Not here in Alabama. Maybe NJ, anyone else know? And you still have the megaphone!! I was a cheerleader all through highschool so this brought back many memories. Now, after retiring from attending every single UT Longhorn game played, I’m enjoying NFL football so much. The Houston Texans and New England Patriots are MY teams now!! Happy season!! WOW…..what memories….time treasured but not forgotten….My fondest memory is of my mother at my brother’s football game with her “COWBELL” everyone in the stands feeling the excitement of the moment that was happening on the field there was mom filled with joy and ringing her COWBELL along with everyone else and low and behold the person sitting in front of her getting slammed in the head with mom’s COWBELL…….!!! That is so endearing. Thank you for sharing your beautiful memories. Oh thank you so much for the memories. I moved recently & while I was consolidating memories I came across this huge homecoming corsage minus the mum. The football was attached to the ribbons that were extremely long with the high school name done in glitter down the ribbon. I just sat for a while & remembered those days & dug out the old annuals 1963 thru 1967 Banks High School Jets. Those were the days! You being an Alabama fan you will recognize those as the days of Johnny Musso in high school. Homecoming was THE event of the year in those days. Thanks again. Oh yes!!!!! Musso rocked. He was fabulous. Such sweet memories . I too miss those BIG gorgeous over the top mum corsages. The bigger the better. It was a fun time . No more class rings on chains and wearing your boyfriends letter jacket. Last time I received a mum was for my husbands West Point reunion. 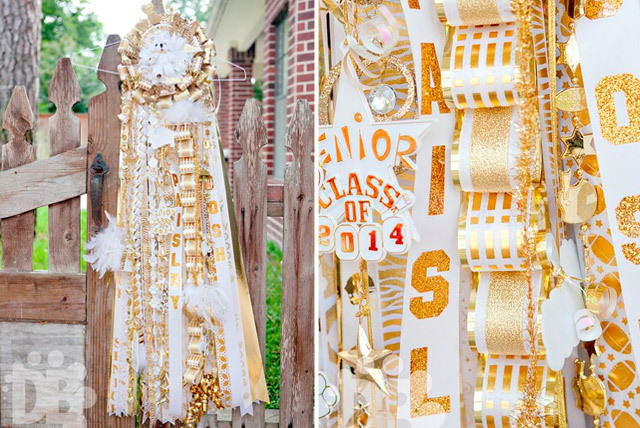 It was just a yellow/gold mum with ribbon and his class year placed on the short ribbons. I loved it! I agree with you bring back the super corsage! I believe the girls today would not know or love them as much as we did. Awww, glorious football season! There is nothing like it here in my family! When I was a teenager, I never missed a game unless it was so far away, that no one but the players and cheerleaders were going. Fast forward to young adult mother…my children grew up loving football especially our “Dawgs!” We are die-hard GA fans and although we are not season ticket holders, (unfortunately) the first game of the season is always celebrated here at my house because we have the 60″ screen. We grill out, and “tailgate” in the kitchen until the kick-off. But I guess the most serious sign that we are GA fans, is that my daughter is getting married this fall – and she checked the GA football schedule before selecting her wedding date! Oh yes, we plan all events around the games! It’s the thing to do. Haha. Definitely the thing to do in the South! Growing up in England, we didn’t have such occasions as college football and such. We did have footy and I supported Liverpool (only because my 5 brothers made me), but we didn’t make it as much fun as this. Since moving to the Georgia, I have adopted so many wonderful southern traditions, Americans seem to embrace life and each season and I am having so much fun. Maybe, I should start watching college football now! I remember those mums, and as a drill team member I also remember making “voodoo dolls”. Those little yarn dolls made out of yarn with the opponents school colors with a safety pin through the heart. . We’d sell them for a quarter, pin them to our uniforms and be on our way. It’s funny the things that get into our souls. There is something about Autumn and Football season. When I married and went overseas with my husband, I was never as homesick as Fall. I wonder why that is? Maybe it is something about team spirit, comfort foods, and being at home. Phyllis, I am so with you on this one. As a girl I used to watch the old black and white movies and in any football movie, the girls always had the large mum corsages pinned to their coats. I went to college in the late sixties and boy things had changed. No mums, or tradition at all. Just jeans because we were too groovy for tradition. I secretly was so disappointed. I really hope that you will wear a mum to each of your games. Even this small gesture can possibly start the old tradition up again. I surely hope so. Please let us know if you do and if you get any comments. I bet you do. Thanks for sharing with us through your blog. Thank you. I love tradition,too!